MACO Development is a full service development company that can take a development from start to finish. MACO Development has been very active for over a decade. To see What's Happening, be sure to stay up to date with our news page. For more information on how MACO Development can be of service to you, please contact us. At MACO Development Company, we pride ourselves in understanding the ever changing needs within the multi-family housing industry. We focus on marketability, sustainability, and affordability. Each and every development is vigorously analyzed during the conceptual stage to ensure that we get it right the first time. MACO Development Company has extensive experience in working with various state housing tax credit agencies, the United States Department of Housing and Urban Development, and the United States Department of Agriculture Rural Development. Not only is MACO Development Company focused on new construction but it is also committed to the concept of preserving existing affordable housing developments. 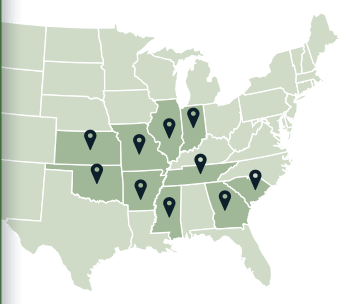 Since its formation, MACO Development has been involved in new construction and acquisition/rehab developments in Arkansas, Georgia, Illinois, Indiana, Kansas, Missouri, Mississippi, Oklahoma, South Carolina and Tennessee. On behalf of my Aunt Lucy and our family, I would like to express our sincere thanks to the Lakewood Hills Senior Village ownership and management. My aunt is so overjoyed to live in such a warm, inviting, helpful, modern and secure environment. We have never seen her happier! I am so ecstatic to be living here at Lakewood Hills Senior Village! The apartments are spacious and the amenities make chores and daily living easier and more convenient. Lakewood Hills Senior Village is a relaxed place to visit and enjoy new friendships over a cup of coffee or a glass of tea.